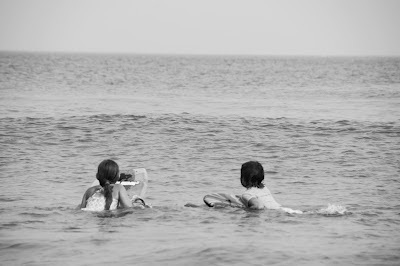 There is this moment, with boogie board in hand, where you wait and watch. As you float in the calm sea you know in a few short moments they will come, a string of curling waves with enough power and strength to take you all the way in to the sandy shoreline. As they approach you have to decide, is this the perfect wave or do I wait for the next one? Every day is a balancing act between taking a risk or waiting just a little bit longer. Knowing when to hold 'em and when to fold 'em (you know the song). Making that decision, pulling the trigger as they say, can be difficult. If you keep passing up opportunities waiting for the perfect one, it may never find you. Is a "perfect one" even possible? Or is perfect just a fancy way of saying, "the one that I want"? I'm often looking for the "perfect time" to do or say something. What a useful excuse to not do it or say it at all. Is perfect timing when I don't have to take any risks? When I feel the most comfortable? Is this even something I can measure? I can't think of one thing in my life that's perfect. And yet it's a standard I often find myself applying to life. Whatever your circumstances we have all had to decide "is this perfect enough?" But what about me? Am I perfect enough? Am I acceptable enough? Maybe waiting for perfect means never having to put yourself out there. Never having to get into the ocean. Why bother even putting on a swim suit? This world is flawed. We do what we shouldn't do instead of what we should do (Romans 7:15). We expect perfect when it doesn't exist. When our standards are high, no one, not even our own selves, will ever measure up. We want things our way and we want them now. We tell ourselves and our God how things should be. We demand it! And when we don't get it or it doesn't look the way we want it to, we complain or are dissatisfied. If we constantly look to the horizon, waiting for something better, we are going to miss out on what's right in front of us. If we strive to control our lives, seeking to fill it with only "perfect" things, we will always be disappointed. May our desires be focused on loving who and appreciating what we have. May we take the risk to accept the broken and imperfect however it comes, even within ourselves, even if it isn't what or how we wanted it (Psalm 147:3, 2 Corinthians 12:8-10). 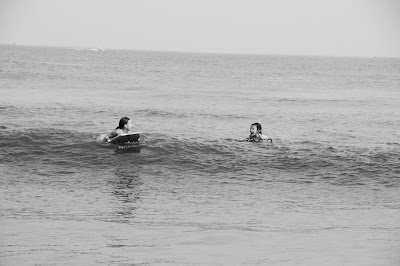 There is this moment, with board in hand, where you wait and watch. And as the first of the curling waves approaches you decide…to take what's been given to you and ride it as long and as far as it will take you. Stopping in from God Bumps today and am so glad I did. This post is a "holy echo" for me-- just confirms the same message I'm getting from God these days. Stop waiting for perfect! THANK YOU for these rich words. Thank you, Alicia, for visiting! I'm very glad God spoke through these words today. I love how you put it, a "holy echo"! God bless!